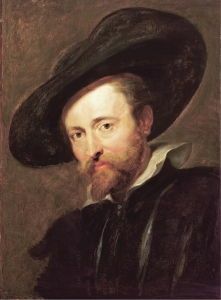 Peter Paul Rubens was renowned throughout Flanders when there appeared in his school in Antwerp a young man possessed of such noble generosity of manners and so fine a talent for painting that he gave every indication that he would bring it distinction and add splendor to the dignity and excellence to which the master had raised his profession. 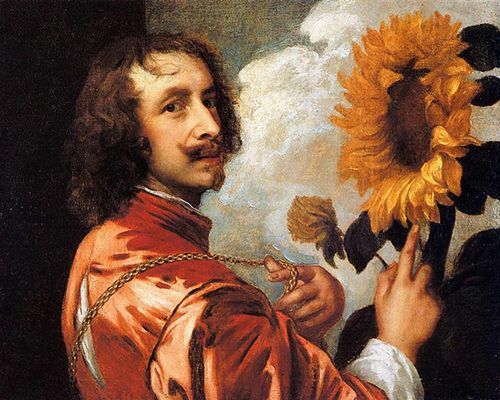 This was Anthony van Dyck, born in the same city in the year 1599. 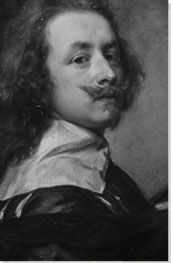 Anthony Van Dyck was born, the seventh of 12 children, into a wealthy middle-class family in Antwerp; his father Franchois Van Dyck worked as a silk merchant. 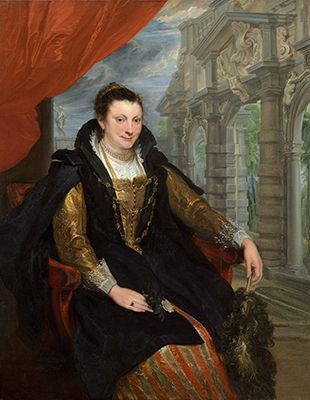 Van Dyck came from a family of artists including his paternal grandfather and his mother Maria Cuyper, who died when he was only eight years old and was a skilled embroiderer. Taking advantage of the guild system in place in Antwerp during his childhood, Van Dyck began an apprenticeship with the artist Hendrick van Balen at the age of ten. Although the exact length of time is unknown, Van Dyck spent a few years living and training with van Balen before he left to set up his own studio whilst still in his teens. This was quite an achievement as it was done before obtaining the status of master painter which he did in 1618, when he officially joined Antwerp's Guild of Saint Luke. It was, perhaps, because of these early successes that he was referred to as the "Mozart of painting". Sometime during this period Van Dyck met his fellow countryman, artist Peter Paul Rubens. Van Dyck was so eager to learn from him that around 1617 he gave up his own studio to become Rubens's chief assistant and this resulted in a mutually beneficial relationship for both artists. 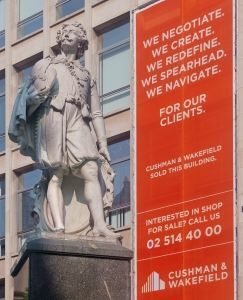 Van Dyck helped Rubens with many important commissions, whilst Rubens taught Van Dyck much about the artistic process. 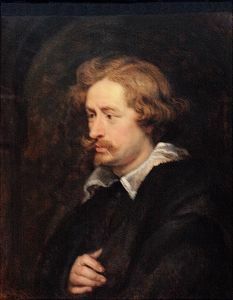 Rubens's stylistic influence can be seen throughout Van Dyck's work, although Van Dyck never embraced the classical style which Rubens preferred. During his time in Rubens's studio, Van Dyck's family life was in upheaval. His once prosperous family's reputation began to decline after a scandal involving his father and a woman who defamed his father's character and threatened him with violence in what is generally believed to be a relationship turned sour. 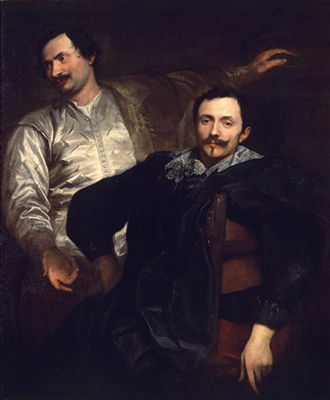 In 1616 two of Van Dyck's brothers-in-law went to court seeking control of the family money claiming that the artist's father was mismanaging it. 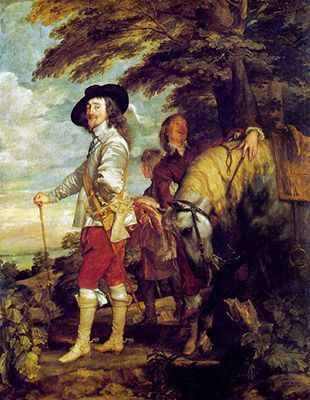 Van Dyck brought his own suit asking the court to appoint someone to manage the funds rather than his brothers-in-law and another one, later, to have the court return from his brothers-in-law what was rightfully owed him and his younger siblings. 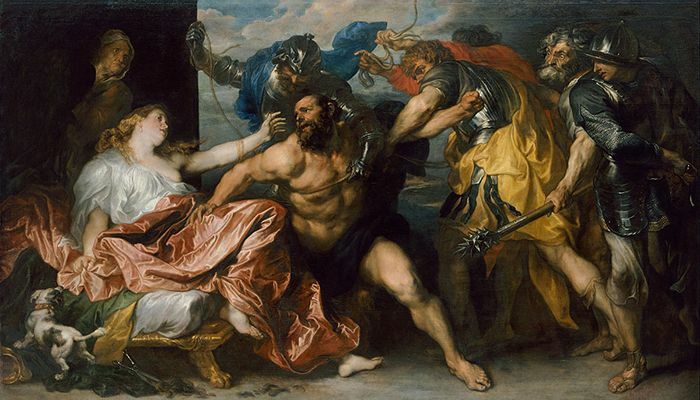 Consequently, the relationship with Rubens went beyond that of mentor and student. 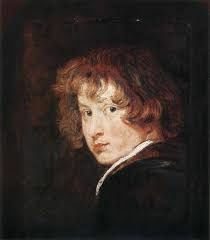 Rubens, who was 22 years older than Van Dyck became a father figure to him, filling a void that was missing in his own family after the loss of his mother and a disintegrating relationship with his father. 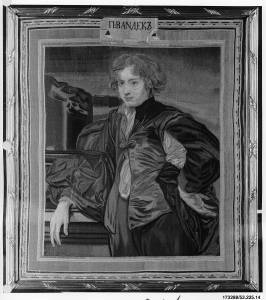 Tapestry of a Self-portrait by Anthony Van Dyck from the late 18th century. In the collection of the Metropolitan Museum of Art, the work was created by the Imperial Russia Tapestry Manufactory, Saint Petersburg, Russian. Having already begun to establish a good name for himself in Antwerp, Van Dyck traveled to England in 1620. In doing this he sought to advance his career by emerging from Rubens's shadow as well as distancing himself from his family. It has also been speculated that he may have wanted to leave Antwerp because he had made a woman pregnant; a fact he did not acknowledge until recognizing his illegitimate daughter, Maria-Theresia, in his deathbed will. While in England he was appointed as court painter for King James I and he began to focus on portrait painting rather than his earlier religious themed works. Van Dyck, however, did not find life at court to his liking, perhaps due to his reserved nature and strong Catholic beliefs. It was also in England he suffered his first bout of what would be a lifelong battle with depression. His desire to leave England was complicated by his commitment to the court; however an eight-month leave for travel was arranged in 1621 by Lord Arundel, who, along with his wife, would become key patrons of the artist. While Van Dyck was only supposed to travel for eight months, he did not, in fact, return to England for 11 years. He went, first, to Antwerp and then traveled to Italy in November 1621, staying in Genoa and then moving to Rome. Here, he made many sketches that became known as his Italian Sketchbook (1621-27) which included drawings of paintings he studied, especially those of Titian. During his trip he also spent time in Bologna, Florence, and Venice where he met up with Lady Arundel and with whom he traveled to both Mantua and Milan. Her plan to convince him to return to King James's court failed and he stayed in Italy after she sailed back to England. His success as an artist grew and he began to travel with increasing numbers of servants and adopted a more flamboyant way of dress which was described by one of his earliest biographers, Giovanni Pietro Bellori, as including, "...gold chains, [and] feathered hats". While in Italy he also traveled to Palermo where he met the, then 96 years-old, artist Sofonisba Anguissola of whom he painted a portrait and described as, "...very quick witted and kind". 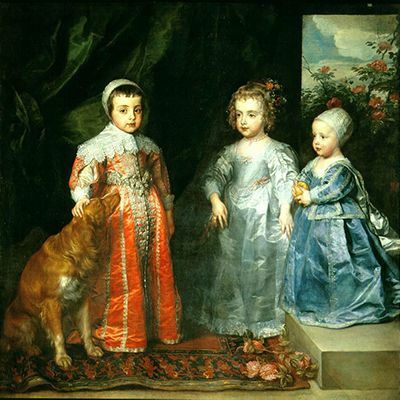 In 1627 family issues brought Van Dyck back to Antwerp. These included the death of his sister and another court case to prevent his brothers-in-law from taking over what was left of his family inheritance. Despite these financial issues, by this point his own wealth was substantial and this allowed him to build an impressive art collection of his own which included a number of paintings by Titian. While in Antwerp he also registered to be a member of the Confraternity of Bachelors, a prestigious religious group and became court painter to the Archduchess Isabella. This was only possible as King James had died and Van Dyck was thereby released from his obligations in the English court. One area of focus for Van Dyck in the later years of his career began in the 1630s when, in partnership with publisher Martin van den Enden, he began work on his Iconography series, a curated selection of printed portraits, some based on past works and others specially created for the project. This can now be viewed as an album of the artist's friends and important people of Antwerp in the period. In 1632, Van Dyck returned to England where he was made official court painter for King Charles I and his wife Queen Henrietta Maria. In this role he painted a large number of portraits of the King and Queen as well as of their children and he developed a very close relationship with the King who regularly visited his apartment. This was a period of growing unrest in England and these internal divisions led to the Civil War in 1648 and ultimately to the execution of Charles I. Van Dyck's paintings served as a propaganda tool for the Stuart monarchy, presenting the royal family as powerful but also human. 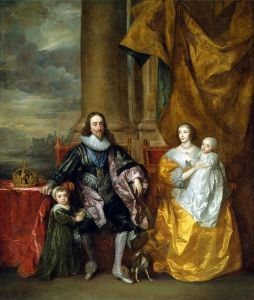 This unique combination of formal state portraiture and relaxed family domesticity is clearly visible in his first royal commission Charles I and his wife Henrietta Maria with their eldest children (1633). Van Dyck was also more popular and social during his second stay in London and he began an ill-fated affair with a courtesan Margaret Lemon who was highly jealous of the attention he received from other women and as biographer Robin Blake explains was rumored to have, "...threatened, even attempted, to bite off Van Dyck's most useful digit, his thumb, if he was ever unfaithful". Perhaps unexpectedly, at the height of his popularity and appeal, Van Dyck made the decision to settle down and in February 1640 he married Mary Ruthven one of the Queen's ladies-in-waiting. Despite this happy relationship, Van Dyck's depression manifested itself again and began to deepen. The death of his mentor Peter Paul Rubens later that year weighed on the artist and caused him to briefly return to Antwerp. His failing health also prevented him getting the commission to decorate the Louvre for King Louis XIII of France and while he traveled to Paris in 1641, he was too ill to meet with the king. Upon his return to London, he was so ill that a concerned King Charles I offered a £300 reward to any doctor that could cure Van Dyck. Despite his poor health he was able to witness the birth of his daughter Justiniana on December 1, 1641. Two days later he made his will and six days after that, hours after his daughter was baptized, he died at the age of 42. While his loss was felt by many, the most notable expression of grief came from the King who ordered his tomb to be engraved with the message: "Who, while he lived, gave to many immortal life". Van Dyck's greatest legacy was in portrait painting where he pushed the boundaries of what a portrait could be and modernized it for generations to come. He is particularly noted for introducing a unique informality of composition to his portraits and for his flattering renderings which succeeded in losing none of the individuality of the sitter. Van Dyck also had an impact through his choice and treatment of clothing, bringing the idea of fantasy dress in portraits to Britain. The artist lends his name to the Van Dyck beard, Van Dyck collar, and Van Dyke suit, which were fashionable in the early 17th century and were immortalized through his paintings. These items found renewed popularity in the 18th century in imitation of his works and were worn to masquerades and in later portraits, most notably in Gainsborough's The Blue Boy (1779). According to critic Keith Thomas, "nearly all the great 18th-century portraitists, from Pompeo Batoni and Allan Ramsay to Thomas Gainsborough and Joshua Reynolds, copied Van Dyck's costumes, poses and compositions". Furthermore, the intimate way he captured the essence of his sitters helped to lay the foundation for the approach of contemporary artists including John Currin and Lucian Freud. This work depicts the moment of Christ's betrayal by his disciple Judas. 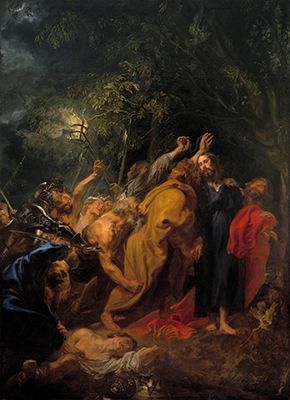 Set in a wooded landscape, this biblically themed piece features a cluster of figures reaching out toward Christ who is pictured near the right side of the canvas dressed in a blue cloak. Judas is shown wearing a gold-brown robe and is positioned to the left of Christ, bestowing the kiss that completes his treachery. In the left foreground Christ's apostle Peter, with sword raised, is in the process of cutting off the ear of Malco, the High Priest's servant.